Reaching out to a handful of people who showed interest in our web-based product but who didn’t have an appetite for our enterprise pricing. Hoping some will sign up for the blog, as a sort of preregistration list for when the software is ready to download in the next week or two. Sure feels nice to be the bearer of good news! Your hope is not in vein, Darin. 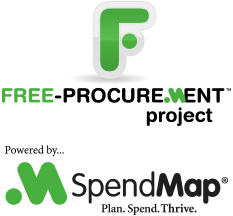 I’m one of the folks interested in SpendMap’s software, but not the enterprise pricing. I just subscribed to the blog and I look forward to when the software for the Free-Procurement Project is ready. It also feels good to be the reader of good news. Congratulations. Our pleasure, Bob. Glad we can help.